It's a Tuesday morning around 7am. Ann, Min, Bpaet, and Mo are supposed to be on their way to school. Instead, they're riding in the back of a small passenger car, sticking their heads out the window whenever they passed a classmate on a bike, yelling, "Hey, we're gonna go get fights!" It's the day before Loi Krathong, an annual Thai festival in which small wreath-like boats are released into rivers and lakes to show appreciation for the river spirits and Mother Nature. 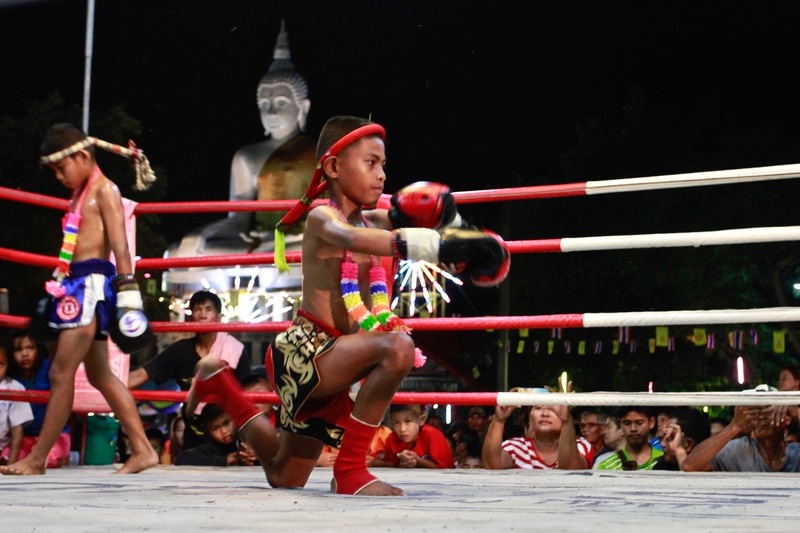 Festivals are held all over Thailand, and many feature Muay Thai matches. It's these small festival shows that give young fighters their start. 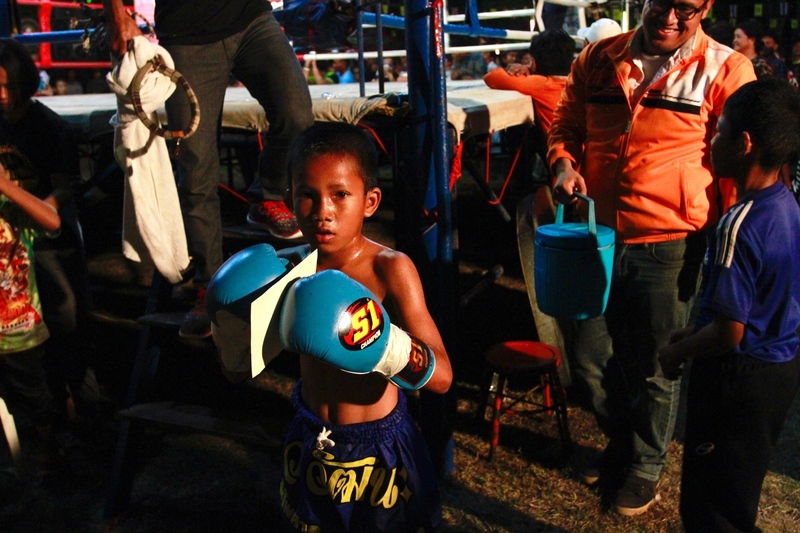 For kids growing up in Isaan, Thailand's largely agrarian northeastern region, the chance to fight at any show, Loi Krathong festival or otherwise, is a chance to earn money for their families and maybe even make a name for themselves as professional fighters. That's why Min, Ann, Mo, and Bpaet are allowed to skip school. The boys, Bpaet and Mo, and the girls, Ann and Min, all between the ages of 12 and 13, have been training and fighting out of the new village gym, Wor. 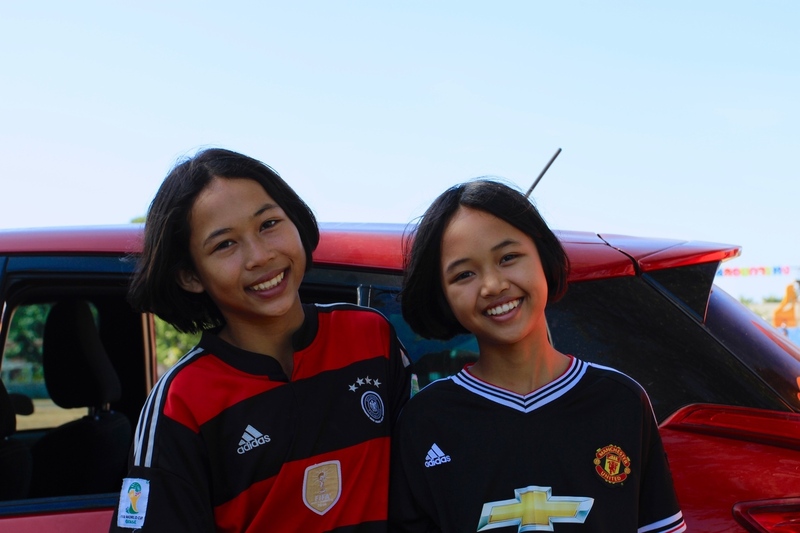 Watthana, for close to a year, under the guidance of gym owners Boom and Frances Watthanaya, a Thai-Canadian couple who returned to Boom's hometown in Khorat Province last year and opened their doors to local kids. Twelve-year-old Mo sits miserably in the back of the car. The shyest of the bunch, he sticks his head out the window not to boast to his classmates about getting fights but to combat carsickness. Having grown up riding on motorbikes and in the back of pickup trucks, this is his first time in a passenger car. Boom and Frances turn around from the front seats. "How will you ever get to Lumpinee if you keep getting carsick, Mo?" Boom laughs. "You just gonna sit in the back of a pickup truck all the way there?" 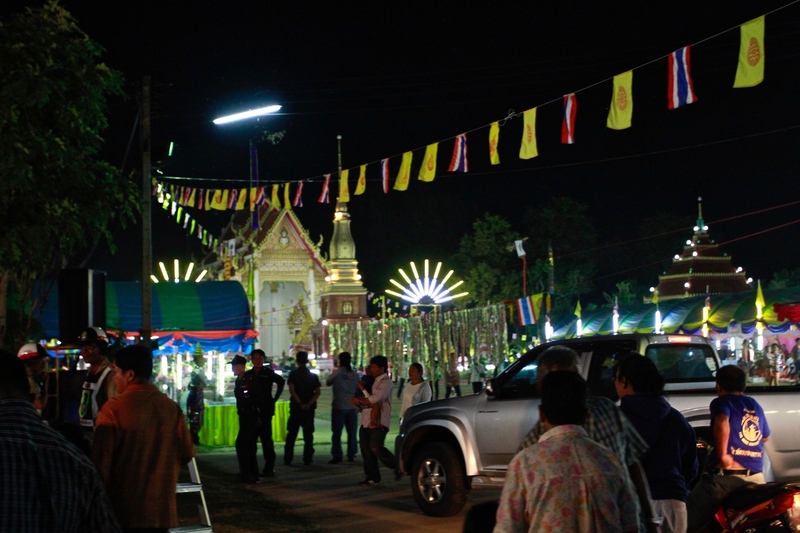 Mo's nauseating journey ends an hour and a half later in the town of Phimai. Boom, Frances, and their four village kids rush up to the promoters, surrounded by other local fighters and gym owners, all hoping to be matched for a fight that night. The Wor. Watthana fighters look around at the other children their age, most of whom are wearing school uniforms, having been allowed to leave school temporarily for the match-ups. They wonder which of these kids they may be fighting. 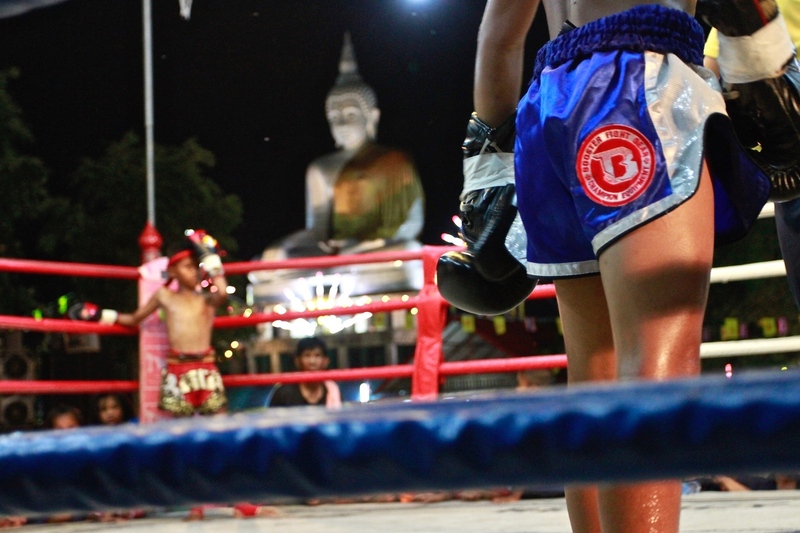 Match-ups in rural Thailand are like a circus. Everyone storms the matchmaker (who often doubles as the promoter). Gym owners push and shove their fighters to the front like rabid American soccer moms elbowing each other at doorbuster sales on Black Friday. There's a cacophony of yelling: How much money do you have for the side bet? Nothing? Then he can't fight him! Oh yes he can! Are you sure you wanna get knocked out then? SURE I'm sure, let me get knocked out, I'll fight him! It's hard to get a fight. 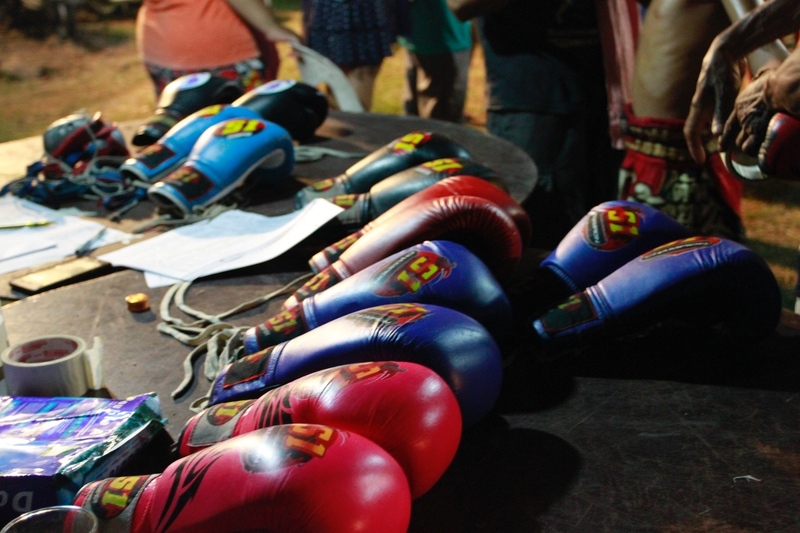 Matches are a way to make money and a way to forward your name in the Muay Thai community. Fighting is the only way to get ahead and while there are ample fighting opportunities, there are also potentially thousands of fighters clamoring for those spots. Much to her relief at this particular match-up, Frances is able to use the connections she's been building as a new gym owner for the past year, to secure a match for all four of her boxers, including her two girls, notoriously hard to match due to the perpetual shortage of female fighters. Min and Ann are the only female fighters present at the early morning match-ups. Their potential opponents are at home or in school. No weigh-ins for them; Frances and the other gym owners, connected through the promoter's telephone, are so desperate for matches for their girls that they agree to fight, sight-unseen. In small-town shows, mismatches are common. The Wor. Watthana kids understand how it works, though. They're still excited about the prospect of fighting. They are quick to rush up when Frances calls them to be paired. Otherwise, they play with a mother cat and her four kittens off in a corner. Boom is off on his own too, observing from the sidelines. This may be his home turf, but he's happy letting his blonde Canadian wife act as the main face of Wor. 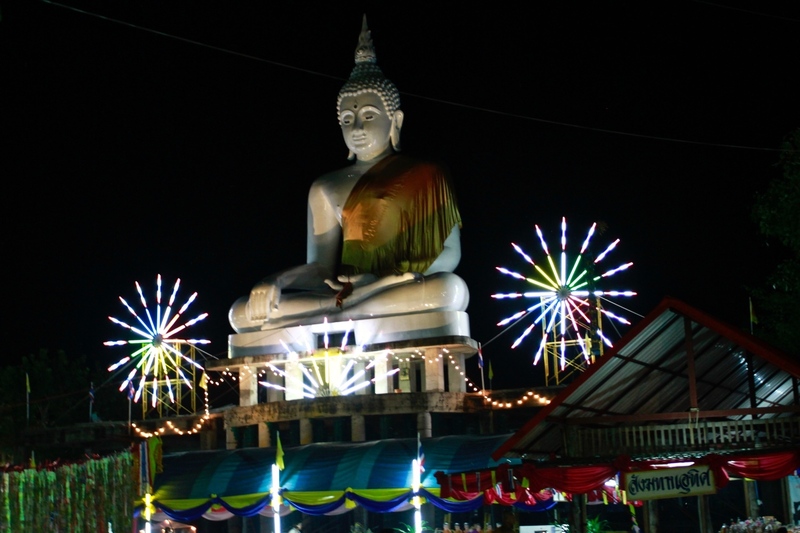 Watthana. Frances is the one he credits for building the gym. Everyone knows her, and he keeps a low profile. At previous festivals, Boom has been mistaken for one of Frances' adult fighters. One time, Boom was asked how much the foreign woman paid him to hold pads at her gym. Boom prefers it this way. Dealing with certain people in the Muay Thai community gives him a headache. Instead, he sits at a table alone and waits for Frances, studies the faces of the passers-by, listens to what they say to each other about their matches, sees if he can learn anything that may help his fighters in the future. 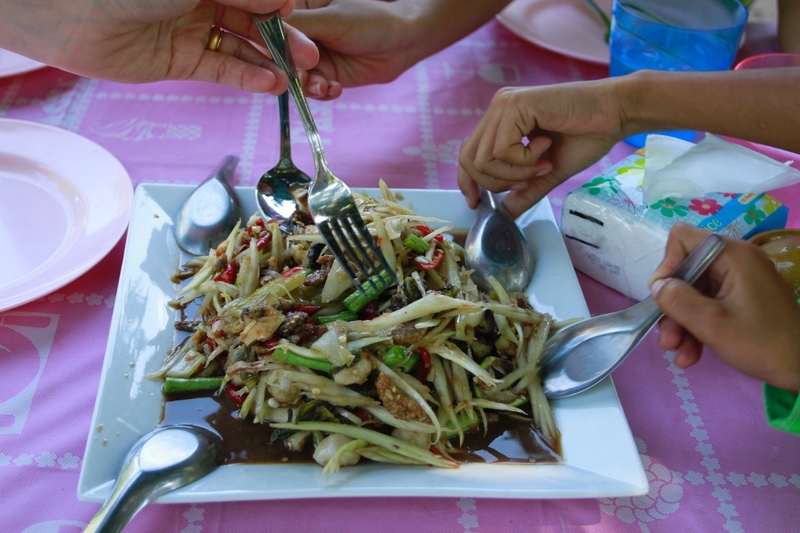 After their successful match-ups, lunch at a roadside stall on the way back to the village is in order. 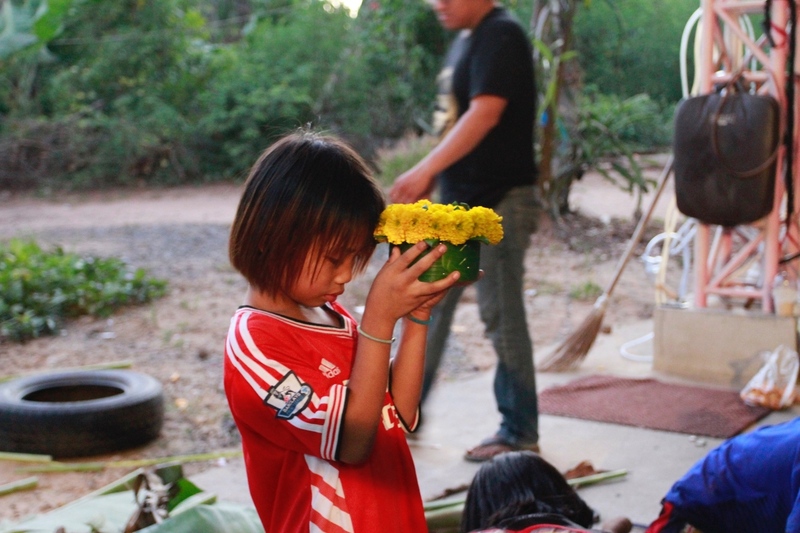 The kids tell Frances and Boom they're enthusiastic about fighting, but still want to enjoy Loi Krathong. 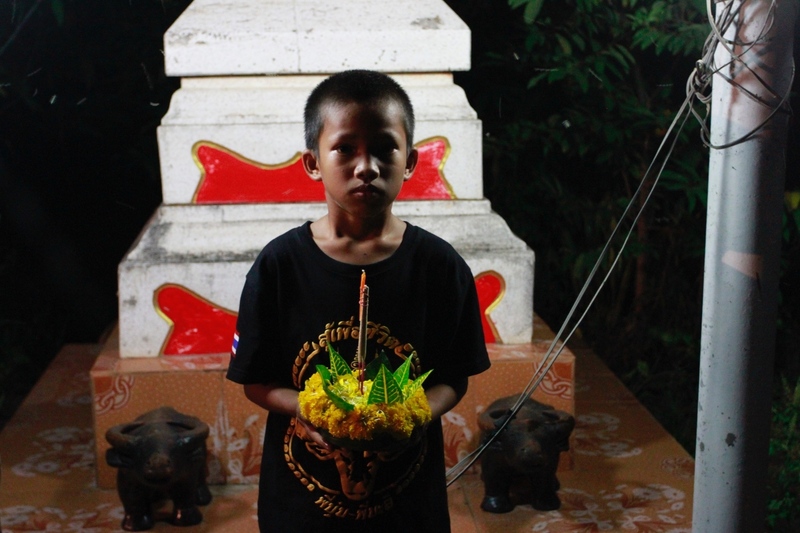 It's their first year fighting at the festival, but participating in Loi Krathong is something they've been doing their whole lives. They've never missed out on it, and when Frances first asked them two days ago if they wanted to fight, they'd been a bit hesitant. "Don't worry," she had said. "You'll get to do Loi Krathong too." It was then that their faces had brightened and the excitement had begun. After a four-hour rest in their homes before the fights, Frances and Boom do their second pick-up round of the day. It's dark by the time the Wor. Watthana fighters arrive at the fairgrounds in Phimai again. Things are challenging for the Wor. Watthana team. When the gym's other trainer was too drunk to show up, Boom knew he'd be bearing the burden of cornering alone. Luckily, 12-year-old Bpaet is stepping up to the challenge. Bpaet has never cornered before, but he's seen it done. Quiet little Mo is the first up. No cornering necessary for him; it doesn't go past the first round. Illegal kick to the groin, and Mo isn't able to recover in time. Disappointing first fight for the team. Mo's big sister Min enters the ring next. As soon as the bell rings for the end of every round, Bpaet the Cornerkid is the first to jump in. He rubs her arms and legs down, gives her water, holds smelling salts under her nose. He yells at Min like he's a seasoned trainer. "Min, you just fight like we trained! You've got it all! Elbows, knees, kicks! Just remember, do it how we trained!" Adult Boom, who has been fighting for the past 20 years, barely gets a word in edgewise. Despite Bpaet's fervent coaching, Min loses the fight on a close decision. No time for the kids to mourn, though. Ann is up immediately. Once again, Bpaet takes over the coaching. "You've got this one, Ann! No problem!" he says before the fight. After the bell for Ann's first round, Boom pulls Bpaet aside. "Don't tire yourself out," he says. "You're fighting next." Less than two minutes later, the fight is over. Ann is the victor by a technical knockout. She landed solid kicks, and her opponent fell, refused to get back up. To Bpaet and Boom in her corner, it looked like her opponent just lost heart. When it's Bpaet's turn to fight, he's so little that Boom practically has to pick him up and put him in the ring. Three seconds after the ref says, "Fight! ", Bpaet opens with a gorgeous head kick, shaking up the other kid and affecting his confidence for the rest of the fight. Bpaet is in his element in the ring. It's clear from the way he interacts with the audience, the risks he takes, the little dances he does between rounds. He's a true showman, and every fight is a big deal to him. His unorthodox fighting earned him the nickname Ling Lom, Dancing Monkey, and the audience loves him. He's turning into a little superstar at these festival fights. By the second round, Bpaet's opponent is overwhelmed and throws in the towel. Frances breathes a sigh of relief. It's only midnight, on the earlier side for these kinds of fight nights to end. She metes out the fight purses. Each kid just earned the equivalent of a day's worth of work; minimum wage for labor jobs in Thailand is 300 baht (about US $10). The kids can't wait to go home and show their families those pink 100-baht bills. They get back to the village at 2am. "Be ready at 8am sharp," Frances tells them when she drops them off. "We have to be at the match-ups by 9." Wednesday is the same as Tuesday: rising early to be matched up at the festival, resting during the middle of the day, fighting at night. 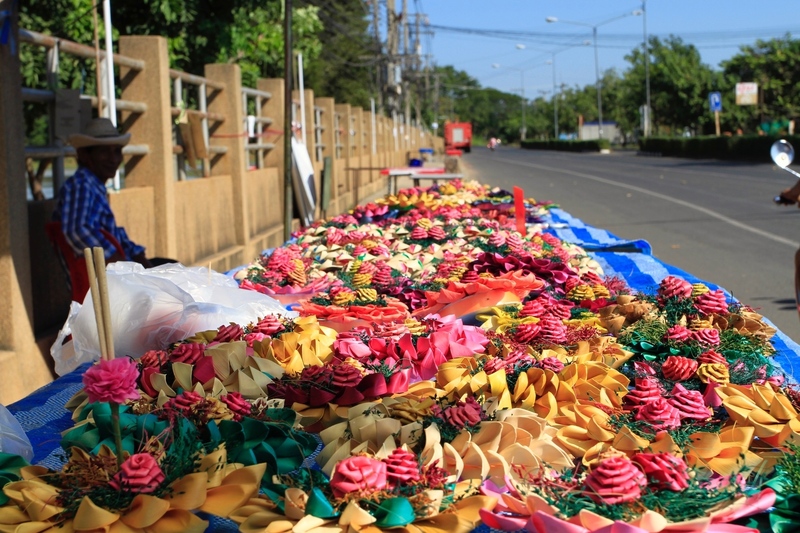 But it's different because today is Loi Krathong. Tonight's festival is much closer to home than yesterday's fair, only a half hour from their village. And best of all, today the four young fighters can make their own krathong boats and watch them sail away. 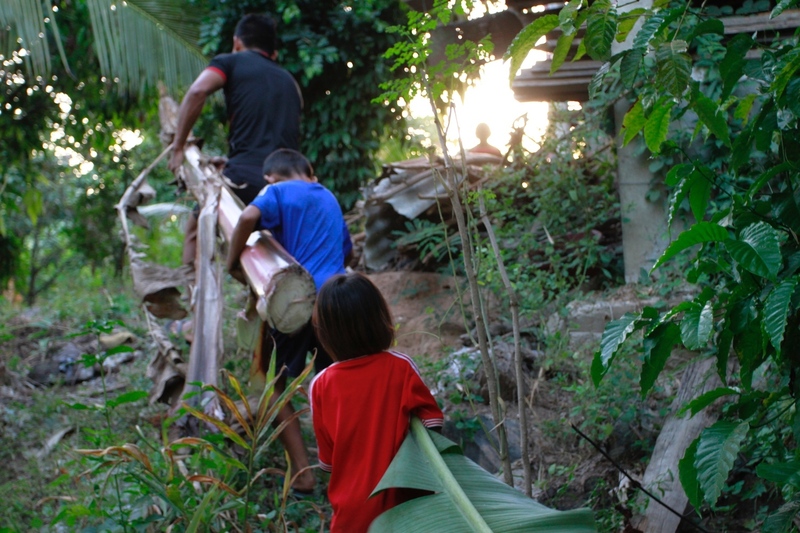 Knowing they'll be making krathong later helps the kids endure the monotony of match-ups. Like yesterday, they arrive at the festival grounds and wait for over an hour for things to pick up. At 10am the matchmakers experiment with different pairings. They find matches for Ann and Min after making some calls, but just like yesterday, the girls don't see their opponents, don't even know their names or how many fights they've had. Mo is called up to fight against another 12-year-old, except this prospective opponent is rumored to have somewhere around 200 fights, 20 times as much experience as Mo. Yes, 200 fights, at age 12. I ask Frances how it's possible to have had that many fights at that age. She pauses for a moment, sighs, then says definitively, "It's possible." The matchmaker's reasoning in pairing the two is that the grossly inexperienced Mo is a little bigger, so his size advantage would even the playing field. Frances has seen the other boy fight before; he was a beautiful technical fighter, but not a dangerous fighter. She agrees to the match, confident her young boxer will be safe. Bpaet is the next Wor. Watthana boy called up to be paired off. The promoter pushes Bpaet in front of a kid named Pupa, a couple years younger than he, but a seasoned pro boasting 100 fights to Bpaet's meagre 10. "I'm not scared! I'll fight anyone!" Bpaet flaunts confidently. Pupa's team isn't concerned about the age difference. At this point in Pupa's career, he's considered such a strong fighter that he often has trouble finding opponents in his same age bracket. In the afternoon, the kids assemble at Wor. Watthana gym in the village, but not for anything to do with Muay Thai. They pull down banana fronds, chop the leaves, assemble them in intricate shapes and decorated their krathong boats with flowers and candles. 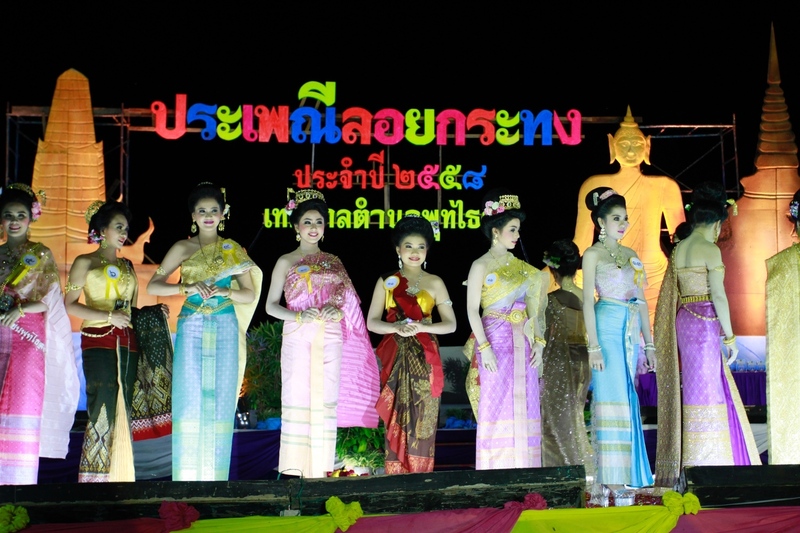 They pass tools to each other, work together but still compete to see who can make the prettiest krathong. No one talks about Muay Thai. Ann and Min work the slowest, putting the most effort into theirs. Bpaet is the first done. He took the money Frances had given him for krathong decorations and bought ice cream with it instead. When it comes time to leave for the evening's fights, the kids venture to the edge of the lake. They light the candles and incense in their krathong, gently place them in the water, and give them a little push. As is tradition, the kids give thanks to the river spirits and ask for blessings of health and happiness and prosperity. Some of them make wishes. As they walk toward the festival grounds, Boom asks the kids what they wished for. Bpaet is the only one to respond openly. "I wished to be a Muay Thai champion!" "Don't wish for that," Boom says. "Make it happen." Language interpretation by Frances Watthanaya.